India can be an overwhelming place. There is so much to try to understand and so much that gets lost in translation. To no surprise to all of you who know me, since I have arrived I have been reading everything I can get my hands on. The local new agents laugh as I purchase every English language newspaper and news magazine they have. I have written some in my blog about the many contradicting faces of India and I realise that no matter how much I learn there will still be so much beyond my grasp. In an effort to add even more substance and context to my trip, I decided to spend the last two weeks on a Global Exchange "Reality Tour" of the southern state of Kerala. Once again GX helped me connect with local leaders, professors, workers and activists so I could hear their stories and ask some of my ever expanding list of questions. 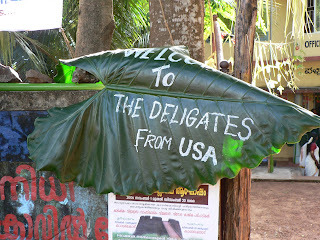 It also gave me a group of fellow US travellers to share observations with. One thing that has surprised me on my visit to Kerala is that this is the community that all those Indians I met (and photographed) in Dubai are from. It feels like a lovely completion of a journey, because when I was in Dubai and meeting so many Indians, I got my first pull thinking that I had to visit India. Although most of my family members have been to India multiple times and have always sung its praises, it wasn't until I met those men that I really wanted to visit. Their sweet soft spirits brought the country to life in a place where I was expecting to meet Arabs. A short school break just to say hello. Every time this happens I get afraid that their teachers will come out and yell at them, but it seems that they like the diversion too. A women making beedie cigarettes out of leaves and tobacco. One of the many co-operatives that I visited to learn about the programs they provide to give better wages and somewhat of a safety net. Last night I shared my overnight train compartment with an Indian family. I had the top bunk so I watched and talked to them from there. They were a small family from Trivandrum, Kerala, in South India. The father was an army doctor. I thought it was a young couple and their two daughters, but at sleep time one of the two girls disappeared so I asked where she went. The mom said rather indignantly that she was not her daughter but her maid and apparently she was sent to sleep in a lower class train car while the three in the nuclear family cuddled safely together.